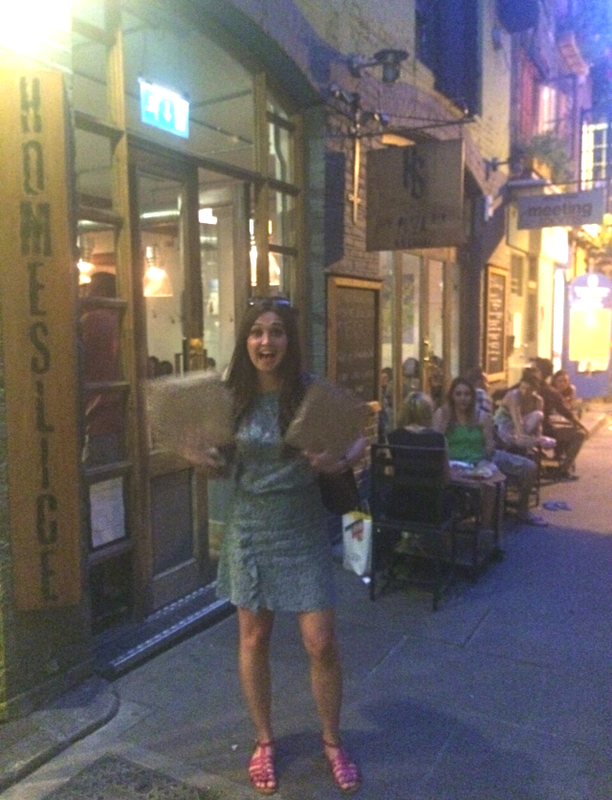 Homeslice is one of my all time favourite restaurants in London. It’s such a simple concept, and a great place to go for a good old catch up over some excellent food and wine. I hadn’t seen my friend Allie since Christmas, so it was the perfect place to go and fill each other in on the last few months. They only serve one thing at Homeslice- pizza. In my opinion, it’s the best pizza in town! 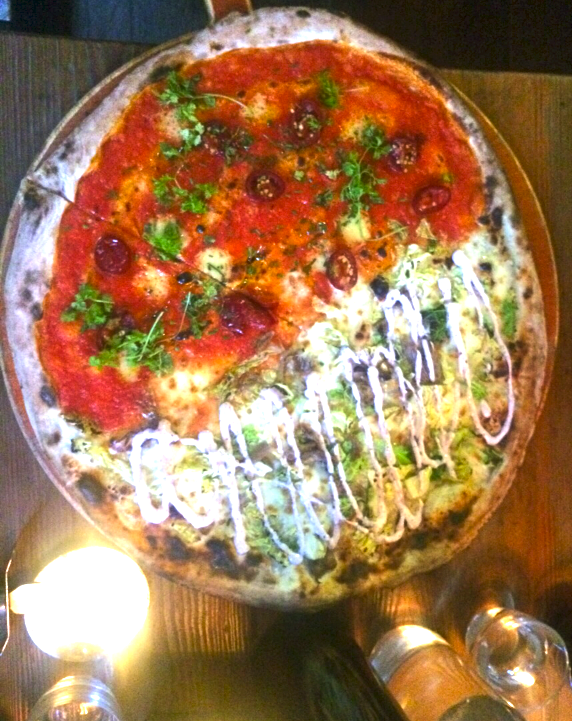 They aren’t stodgy or heavy at all, but are lovely thin flat bases with such obscure yet delicious toppings. 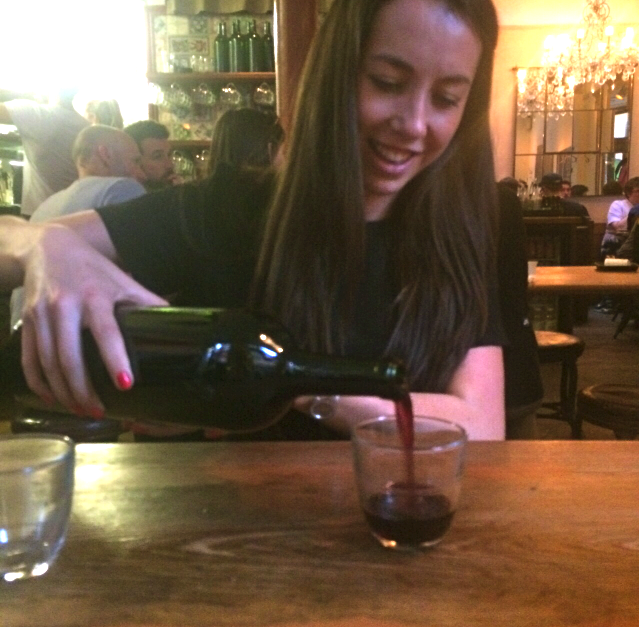 It’s a very relaxed vibe inside, with big long sharing tables and the most friendly staff going. There is a simple choice of beer or prosecco on tap, or wine. We went for red wine. 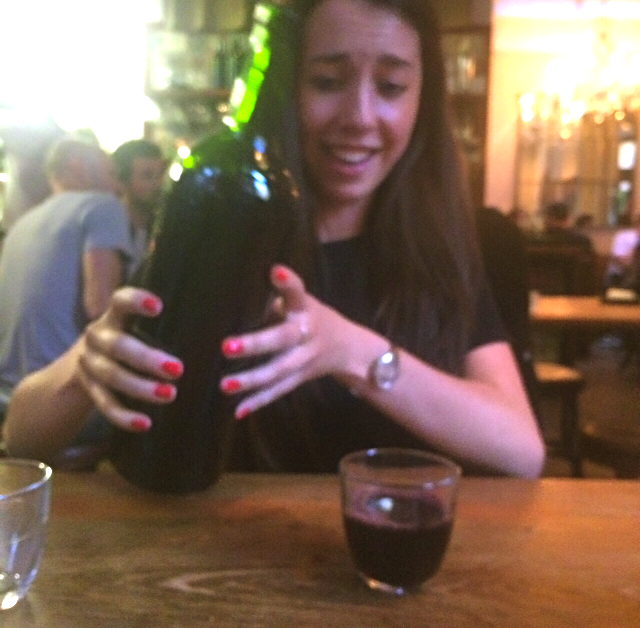 They plonk a giant magnum on your table, and you drink however much you want. They come and measure it with a ruler when you get the bill and just charge you for how much you drink. It really is a huge bottle! 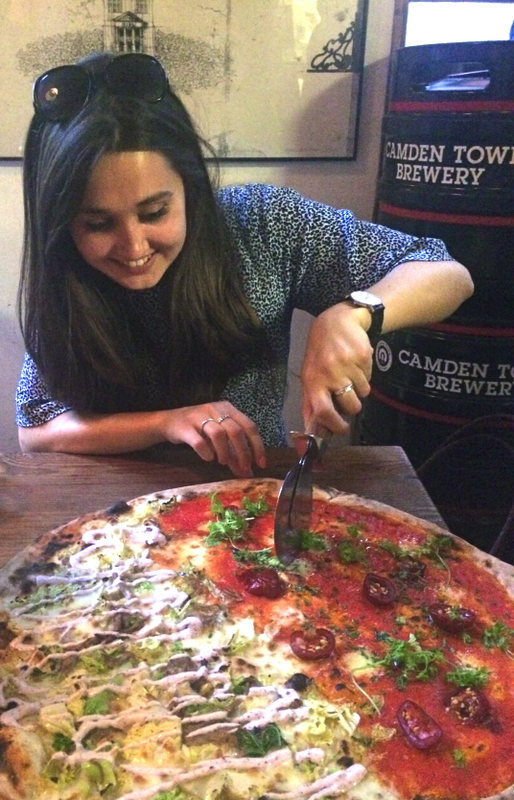 Depending on how hungry you are, you can either go for pizza by the slice for £4, or a 20 inch whole pizza for £20. 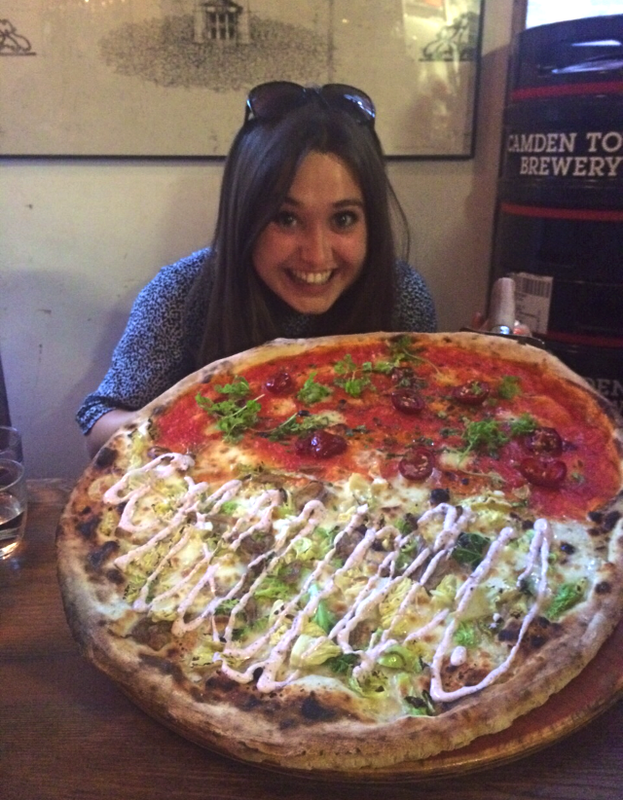 Of course we went for the 20 inch option! For those of you who are as indecisive as Allie and myself, don’t worry, you can go half and half and choose two toppings. The toppings change all the time, but don’t expect your usual choices. If you’re after a Hawaiian then this isn’t the place for you! On one half we went for goat shoulder, savoy cabbage and sumac yoghurt and on the other Calabrian peppers, chervil and Lincolnshire poacher cheese. They were both incredibly good, and the flavours all worked so well together. The peppers were slightly spicy, and the goat was lovely and creamy and mild. Just look at the size of it!!!! It barely even fit on the table. You usually have to wait a little while for a table, but it is 100% worth it. The good thing is they take your phone number so you can wander off and grab a drink, and they will give you a call when your table is ready. It has such a wonderful atmosphere inside as everyone tucks in and shares together, and the food is just exceptional. It’s also incredibly reasonably priced, which always makes it taste that little bit better! The 20 inch pizza could easily feed four people. Neal’s Yard is such a lovely setting too, so if you find yourself in the area with some serious munchies, pop by.